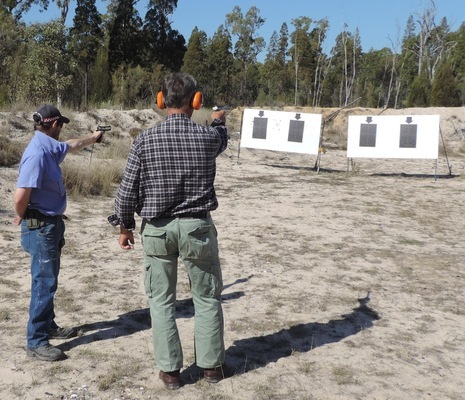 The Inglewood Sporting Shooters had a roll up for their events on Sunday. Iain Brown aka Buckshot was successful in the Single Action shoot filling the placings in the event were Peter (Doc) Solomon and Brad (Little Doc) Clarke. Tom Donald showed his versatility winning the NRA Action Pistol Match and the Down the Line Clays. Stephanie Dudgeon finished in second place in the Action Pistol match ahead of Paul Ugljesa. The Dudgeons also filled the minor placings behind Donald in the Clays. Troy accepted the runners up spot while Michael finished in third spot. This Sunday the club has scheduled a hull program of events. At 10.00am Single Action and Rimfire Benchrest which will be followed at 1.00pm by Service Pistols. A reminder, visitors are always welcome down on the Bosnjak Road Range. Check out all the upcoming action on the club’s Facebook page.